Ash Wednesday (March 6, 2019) marks the beginning of Lent, a season when God calls us to reflect on the meaning of Christ’s death and resurrection. The imposition of ashes – when you receive ashes in the sign of the cross on your forehead – sets the tone for Lent. Each moment you encounter your reflection, your ashes are a striking reminder that “you are dust, and to dust you shall return” (Genesis 3:19b). But the cross, a symbol of Jesus’ crucifixion, offers hope. Similarly, in baptism, you received the sign of the cross on your forehead. 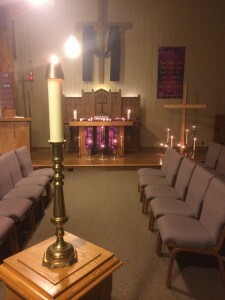 Many of us begin our Christian life with baptism, called “to live among God’s faithful people, to hear the word of God and share in the Lord’s supper, to proclaim the good news of God in Christ through word and deed, to serve all people, following the example of Jesus, and to strive for justice and peace in all the earth.” In the ELCA (Evangelical Lutheran Church in America – our parent church), we describe these instructions as faith practices to guide our daily living. But what do faith practices mean? And how do we practice them? 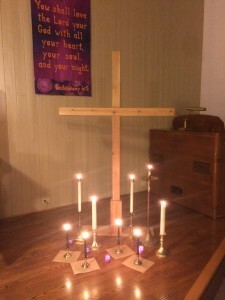 This Lent, as you begin your journey toward the baptismal waters of Easter, we at ELCA invite you to take up faith practices as a spiritual discipline. Don’t Forget to Pray – Kid-friendly devotional that you can download for free. Set Free By Truth – Lent devotions offered by four church leaders. Lords Prayer Words: Traditional & Contemporary Prayers. In addition to Sunday morning worship at 9:30 a.m., we will gather for special Lenten and Holy Week worship opportunities. All are welcome at Christ Lutheran Church. You do not need to be a church member or a Lutheran to receive the sacraments here – follow God’s call to you. Palm Sunday, April 14 at 9:30 a.m.
Maundy Thursday, April 18 at 7 p.m.
Good Friday, April 19 at 7 p.m.
Easter Sunday, April 21 at 9:30 a.m. followed by brunch for all!